I thought I'd best bring to your attention my recent spam clearing exploits here at the Illogiblog. You see, those spambots have been brutally ravaging our innocent posts on the quiet, no thanks to Blogger's recent insistence on manual comment moderation. Comments ranged from blatant adverts for what seem to be incontinence pants, some pink things in a box to, erm, special offers on mutilated sheep or something. Hmm, these spammers are becoming increasingly masochistic. Thank you for give very good informations. Your web is so coolI am impressed by the information that you have on this blog. It shows how well you understand this subject. Bookmarked this page, will come back for more. You, my friend, ROCK! Well, thank you very much! I presume this message was for Tim Berners-Lee because I didn't invent the web, but I ain't about to turn down compliments, however misdirected. Chyeah! Since matching for some time for just a proper read in regards to this kinda ecological niche. What's this, automatic sentence generation?! We expect this sort of language abuse at Illogicopedia, but not here at the Illogiblog! Begone, vile shade! 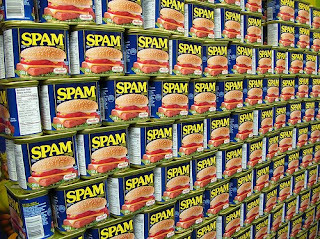 Well, I hope you enjoyed this session of headbanging against ?blog's ever-growing Wall of Spam. It hasn't quite achieved Berlin Wall status yet, but at this rate it won't be long. BEWARE. Hello. I am a poor black man living in Nigeria and I want to open a casino to steal your identity. Please can I has your moneys now.